It has already been 1 year since we began the work of evangelism at Warwick, praise God! All Glory to God for the opportunities that He continues to bring each week. So many tracts have gone out and each and every conversation has been God's Providence and we rejoice knowing that it all will be used by our merciful loving Holy God. This week a Christian brother we have had the privilege to build a friendship with his Granddaughter. While he was in conversation with Rick, I heard her saying "it didn't turn orange!!!" Trying to get their attention she kept looking at it wondering why the good person test was not giving her a pass. I was not far away and had been talking with a lady from our church who had stopped by to see how we were going. I said to this young girl that no one will pass the test. This led into a time of sharing the bad news talking about the commandments in which she knew a few and admitted to breaking them. I explained the courtroom analogy. The Gospel was shared using Easter and Christmas to explain the love of God in providing a way to be saved from hell punishment. The lady from our church was listening in and I pray that she will be encouraged to use Gospel tracts to start off conversations with people where ever she goes. Pray for this young girl as her Granddad follows Jesus she will see her great need to have her sins forgiven to be able to have a right relationship with our Creator God Jesus. It's all His work as we share the good news. All praise and Glory to Jesus. Praise be to our Glorious heavenly Father for His continued mercy and grace upon us. He is answering prayer each week as we ask Him to provide opportunities to speak to the people who He brings our way through the streets of Warwick and to prepare their hearts to receive planted seeds from His word. We pray that He will grow these planted truths into a saving harvest. 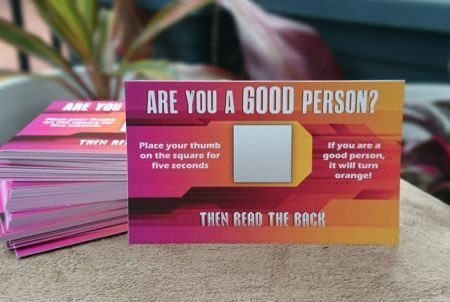 A young guy happened to pass by the bible table and was handed a tract and he asked what it was, so explaining that it was a gospel tract which asked, "are you a good person? ", he said that he thought he was. "Would you be good enough to go to Heaven?" he said he hoped so. We explained the bad news firstly and he said that he didn’t want to go to hell. We shared the good news that Jesus offers us forgiveness for our sins which he paid for when he willingly laid down His life for us on the cross. We need to trust in Him and so we challenged him that there was nothing more important than knowing where we would spend Eternity and to get right with God, for we don’t know if we will have tomorrow. Please pray for M that he will respond to the Gospel and that our Lord draws him unto salvation. 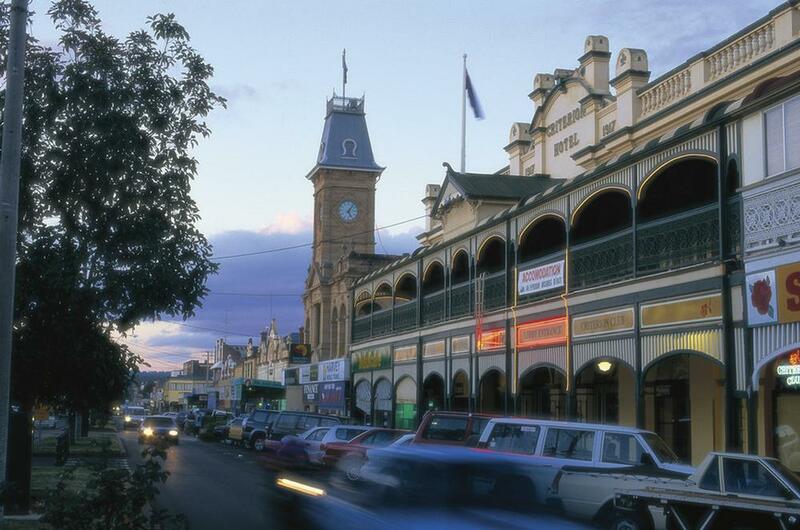 Another chat with a guy who had already been witnessed to in Brisbane came up and started talking with us. He was a friendly guy and very talkative but trying at many times and from different ways to get him to answer questions and pin him down about what he believed would happen after he died proved very difficult. After some time talking to him he had to go. Please pray for (I) that the Lord would convict him of his sin and bring him to salvation. We are thankful to God in all He is doing. All glory be to Him. Today we were thankful to God for bringing back some people we have previously witnessed to. One was from two months ago and the other 2 weeks ago. Firstly a man from 2 months ago who spoke with us about becoming a full-time carer for his niece. He told us she is a Christian and she would like a bible. The bibles we had were not suitable because of small print so we offered to get a bible with larger print for her. P told us he would come pick it up next time he was in town. He has since found he can not continue his caring role. We were able to give the bible to him to pass on to his niece. We have shared the gospel with him and are hopeful that God will use this to draw him to salvation as we shared that Jesus is our greatest need. We hope to see him again. Pray for both this man and his niece, for God to provide all her needs as she moves back to Brisbane and their salvation. Then from 2 weeks ago a husband searching for help for his wife for fellowship. He approached us with a question to where is a good Church for his wife. I had referred him to our church as it was the closest for them to travel. Today we got to meet his wife. She told me a few things that are going on in her life. I was able to encourage her in the Lord. She said they had driven past our church and will attend this week. Both attended our church on Sunday. Rick had a good conversation with a man who was pretty open to questions about Eternity and has planted seeds of truth for him to consider. One conversation I had was with a man who had been Seventh Day Adventist, I was able to share about the lady from the other week who had been excommunicated from that religion and through being treated so badly it lead her to look more deeply into God’s Word. She had found out the truth of salvation and knows that it is not by keeping the law. Rather, we are saved but by grace we are saved through faith in Jesus. which is a gift from God. Then we follow in obedience because of thankfulness to God, empowered by God’s Spirit given to all believers to serve and obey because Jesus first loved us! S was similar in his experience and could see that the religion of SDA is all about rule keeping.The Gospel was shared and tracts given to him just before his mate pulled him away. So we pray for grace to be poured into his life. Many tracts were handed out. It is a good spot we have and God always has plenty of opportunities for us to have little words spoken as we hand them out. Such as “This is such an important message” or sometimes just saying “Hi, this is for you” makes them reach out to take a tract. Praise God that even through reading the Gospel on these little tracts, He can do such a big work in hearts. Thank you for praying. Thanks be our our God our loving heavenly Father for sending us some much needed rain. It sure has been pretty dry out here in Warwick and surrounding areas, to receive some was such a blessing. When we lived back in Brisbane we didn’t think much about rain and drought but out here in the country it is essential to keep the livestock fed and for the crops to grow. It has been a learning curve for us to sympathise with the locals who earn their bread and butter from the land. It was a bit cooler as we started the day handing out some Gospel tracts. R has been coming to the bible table fairly regularly over the last few months and each time we try to encourage and challenge him to get right with the Lord. We are not exactly sure where he is but the signs are encouraging for he say’s he want’s to get to know Jesus and desires to get a device which has an audible bible on it. We have looked into this and will help to get this for him. Please pray that the Lord will continue to draw R unto salvation. An older gentleman stopped when offered a tract and asked what it was about, we said it was the message about Eternity and what happens when we die, he said he didn’t know what happens. After sharing with him that we either go to heaven or hell, he said he wants to go to heaven. Trying to draw out from him if he had any understanding of Jesus he was asked if he knew what the Christmas and Easter message was all about, but still didn’t know, but after explaining to him he remembered a few things from his childhood. He knew some of the commandments and admitted to breaking them. It was explained to him God’s Holiness and the only way to heaven is through what Jesus has done on the cross to rescue us from breaking God’s law. The Gospel was shared and K has a “What is more important than water” and “Are You a good person” tracts. Please pray our Lord reveals his need for a savior. A lady came up to the bible table and asked if she could have a bible for her granddaughter and through our conversation she told us that she was excommunicated from the Jehovah Witnesses and was treated very badly and God used this to bring her to the true gospel. She spent quite a time with us and we were able to be a listening ear and encourage her in her faith in Jesus. Please pray for L as she has her granddaughter coming to stay and that she can pass on the good news of the gospel to her. We give thanks to our Lord for answering prayers in preparing peoples hearts to receive the good news of the gospel. Please keep all the teams in prayer as our Lord builds His church. Still no rain for most of us here, but trust in God’s perfect time it will come. A man in his 90’s stopped to receive a tract and he told us he has a bible on display at home. When he was asked if he reads it he answered not very often. He was very chatty and we eventually got to ask him some important questions about what he believes. He went off track a lot and in his chatting had told us he believes in UFO’s. When we took him through the good person test he would not admit to breaking any of the commandments even when asked about the first Commandment, to Love the Lord your God with all your heart and with all your soul and with all your mind, he didn’t think it was wrong because he said he doesn’t know God. He wasn’t saying he didn’t believe in God, he was demanding God to fix everything and that he wasn’t doing a good job. We tried to explain to him that God is good in all He does. We need to know who God is, and the bible and the words of Jesus teaches us how we can know God that He is Holy and perfectly good and that we all are sinners in need of His forgiveness of sin. We also said to the man to say you have no sin you are saying God is a liar and you are putting yourself in the place of God and breaking the second commandment. He was hard to talk with, as he really was not listening. He became upset and started saying God should give us rain now. He was very proud and told us he is not a sinner but instead he said Jesus was a sinner. As we were trying reason with him he became upset and left. It was very sad to see his attitude toward God and we didn’t have a chance to share the Gospel in words but he did take a tract and we know God’s Spirit is what is needed to change his heart. Pray for T for the work that is needed to be saved. Only minutes after he left a lady come towards us with her wheelie walker and a carer not far behind her, the lady had a sweet smile and happily received “ Everything happens for a reason tract” she said that is so true. Then I said to her that it is the message about eternity and asked her if she thinks she is going to heaven. She shared how she had become a believer 2 years ago. I asked her what happened and if she could tell me. The lady shared that she was watching a movie about the Bible and she told me the part where Jesus was talking with the women at the well, it was when Jesus told the Samaritan women, that He is what she has been looking for. This is what God used to touch her heart to believe in Jesus for eternal life. This dear lady told me she could never go back to where she was. I asked her some questions using our tracts about how the bad news is needed to appreciate the good news, and W was visually and verbally grateful. She reads her bible twice a day and goes to a local church. After she left I was amazed at the contrast of the hearts of the elderly man and this frail women’s heart. It was so beautiful to see God’s work in this lady and sad to see the man’s rejection of God. And it made me think how we would all be like that man if it wasn’t for the grace of God that changed our hearts to believe in Jesus, the way the truth and the life the only way to the Father by His Spirits work in us. At the end of the day a young man stopped after receiving a tract, and asked what it was about, after a short conversation he was then taken through the law using the flip chart, he was admitting sin and after the courtroom analogy about judgment day he was agreeing that he would be guilty and be going to hell. He said he wasn’t concerned, as we talked more he told me briefly about something that had happened in his life and it seemed to me he was holding a heavy load of guilt. After doing my best to explain the mercy and justice of God and His kind offer of forgiveness, the Gospel was explained and his need to trust in Jesus alone to saved from eternal judgment. Only by God’s grace through faith in Jesus will anyone want to get know Jesus and desire to live for Him and His glory. Please pray for T and all the people who received tracts and those who we had conversations with that God will use it all to do the good work to bring repentance and faith to be saved. Pray also those who may need to talk or any help from us will come back to see us. The first person who God brought along this week was a man who has a carer that I have spoken with several times. They had parked close to the Bible table and the Carer said to the man that he could stop with me for chat while she went in the bank. It was a wonderful time to share the news of our need for Jesus to save us from our sins and how Jesus helps in our every need. I don’t know how much he understood but he nods his head and seems to be agreeing he has been given tracts before. Today I asked if he would like a new testament pocket bible, he was so happy to receive, we opened it to look at the Lords prayer because that had been knitted in to what I had spoken to him about today. Pray for L as God can do all things that seem impossible to us and we know His ways are abundantly more than we could ever imagine. God has His people praying for this work and we are so thankful for the connections to people in different denominations here in Warwick and other towns close by. 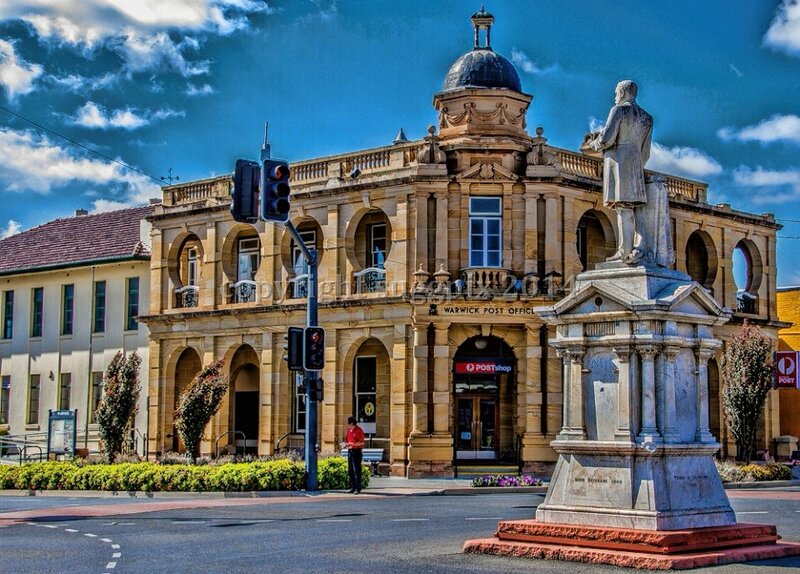 Today a couple from Stanthorpe were encouraged to see the work of God through this ministry. We had a good chat. Then another lady from a local Church had told me that they pray every Sunday for the ministry work. How beautiful is that to know so many others are a part of this work. The church we attend are faithfully praying also and through people reading these reports we write. Thank God for the blessing to share in prayer it even crosses the oceans. We are most grateful to know that Jesus makes perfect intercession to our Father in heaven as we pray. I got to talk with J again from 2 weeks ago. He is the older gentleman who says he won’t believe. But again the Lord was able to challenge him through a cracked vessel like me to turn from unbelief. God helped me with speaking to J, he always wants to stop and he says that it is good what I'm trying to do and he respects me. I think he knows that I genuinely care for him but I tell him I’m just a sign post pointing him to his greatest need. We have explained sin by the law and the grace of Jesus to him and continue to remind him with this truth in love. Then I got to talk with a young man who said he is an Atheist. He was challenged to make sure what he believes is true. 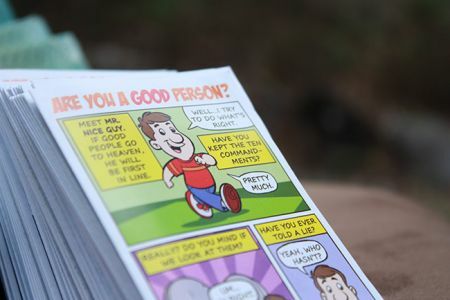 He took a “Are you a good person” comic tract and a “ What is more important than water” tract. He told me he is from out of town for his grandfathers funeral and cut the conversation off saying it wasn’t a good time for this. As he was walking up the street he was reading the tract, he was walking slowly and I prayed to God for him to be stirred in his heart and given truth. I also prayed he might come back. So I grabbed two booklets ready to offer him just in case. The booklets were “Where did the races come from” and “carbon dating” we had a short conversation on both these topics. Not long after Rick and Dale arrived this man came through again! He was with another man, Rick gave the other guy a tract and found out they were from Darwin. I was able to offer the young man the booklets I said, Please look into these things, this is what we were talking about," He received them gladly, Praise God. Lets pray he will read them through carefully and check out what he believes and not just go on what the world says as it is a big lie. There is no proof at all in evolution and there is so much evidence in creation science. The great thing in these booklets from Creation Ministries is they clearly share the Gospel in with the teaching of creation. This is vital as we know the Gospel is what saves sinners not knowledge or in anything we can do. Only the work of Jesus. We pray people will be saved and given a new heart, then they will begin to understand God’s Word and know it to be true because God’s Spirit will bring understanding for the believer. Some things are stumbling blocks though and giving answers from the Bible best. We pray that this may be the way God draws them to believe. We had a older man who lives out of town stop and hear the message of the Gospel. He was open and wanting to know the way to be made right with God to be able to enter heaven. He acknowledged his sin and hell punishment we all deserve. We explained the court room analogy about the payment of sin, justice and grace. Also the parachute analogy to the trust in Jesus alone to save us. Please pray for D he took tracts and has a Bible at home, we encouraged him to open and read the Gospel’s. We challenged him not to put off salvation as we don’t know when our last day will be and that we need to respond to God’s grace before we die. We hope for rain in the dry places but more important we pray for the gentle washing waters of the Holy Spirit bringing life to hard and stony hearts. Thank you for praying. To God be the Glory. It was a quiet day but we are not discouraged at all. We never gauge God’s work on numbers, even if we don’t see any conversions we know every time we faithfully share the Gospel message it is His work in hearts to save anyone. We who are His workmanship are merely workers, spreading the seed of the good news of salvation through Jesus alone. The truth lands on hard soil hearts, rocky ground hearts, thorny hearts and good soil hearts. We can not see anyone's heart. The Gospel is needed for all, no matter the age or soil type. We are called by God to share the good news of Jesus to all people. 10 out of 10 people need Jesus. Faith comes by hearing and the Gospel is the power of God unto salvation. As Christians we still need the Gospel, we are saved by grace through faith in Jesus it is the gift of God not of any works we do. The promise from God is to complete the work He has begun in us, it is a sure thing that God keeps His promises. Growing and learning and being made more like Jesus through His Spirit. His Word is truth and where else is there to go for greater depth as we read and live His ways, but to the love He has shown by dying on the cross to pay for hell punishment we all deserve because of our sin. Thank You Jesus. Jesus has defeated sin and death, by dying and rising again to life, this shows us His power and authority. Encouraging others to read and study God’s Word and find a good church are all what we encourage people to do as it is needed to be in His Word and around God’s people to grow and flee from sinful desires, and to know more of our saviour there is greater joy in our growth. So the ministry has a part also to encourage, equip and build up believers, to help us to grow in many ways, as well as the ministry being for those who are not yet believers and even to those who will not believe. It is all God's gracious love to call all to come to repentance and faith in Jesus alone to be saved to the Glory of God. Two pocket New Testament Bibles and reading bible handout with tracts were given to S who was in a wheelchair she requested for her grandchildren. S told Rick and I she has been brought up in a Brethren Church we gave her tracts and shared the Gospel and reminded her the fact on salvation being all the work of Jesus and not anything we can do to be saved. S loved hearing the gospel which is a good sign but as said we can not see hearts. So pray for S and her grandchildren to have the saving work of God done in their hearts. Also pray for her carer L who heard the Gospel while with S.
Two Christians we have had the privilege to get to know, stopped for a time to chat, we share in the love for Jesus and pray for each other. Right at the end of the day we had the opportunity to talk with an elderly couple. The man told us he doesn’t believe in any of the Bible and he said to me “You haven’t been getting many strikes have you”. Well that was the start to explaining who God is and we can’t save. He told us he doesn’t believe in God. Rick explained the building and builder analogy but he was telling us he won’t believe but we said that God can change his unbelief. We used the law and he admitted to breaking some of them, we shared that if you break the law here on earth the consequences are you will have a fine and it needs to be paid for. As we shared the message of hell punishment and asked him to consider that if it were true how important this news is about Jesus. We talked about conscience and creation some more. I also explained about a blind man headed towards a cliff, I asked him if that were Rick would he call out to him. J said “Yes of course, he might be of some use.” So that was a building block to share how much God cares for him to be saved and God is using Rick and myself to call out to him to believe and hear his call to be saved from hell punishment. Rick had a chat with J’s wife and said she believes what we were saying is true. They both have tracts. Pray as they read the tracts God’s Spirit will do all the work needed in this couple. Thank you for your prayers and may God be glorified in all the work he gives us to do. 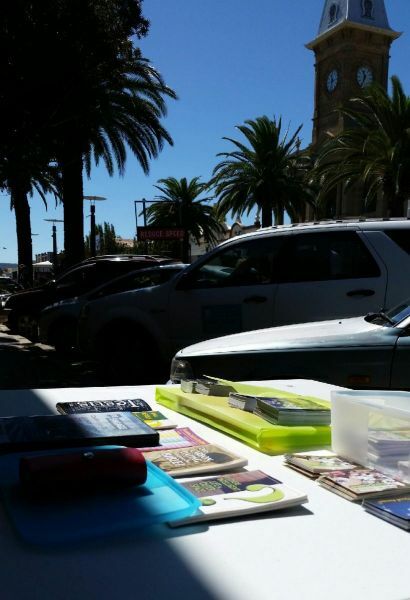 Not long after setting up the Bible table, a man who had parked close by stepped out onto the footpath, walked straight up asking nicely “what do you have here?” After saying a few things about the ministry he saw 'free Bibles' on the banner, he said someone he knows would love a Bible. P ended up sharing how he is helping his niece S who is very sick, he has devoted himself to being her full time carer. The Bible he requested was for his niece, he was saying it will help her. He says that S is a Christian. We agreed that a large print Bible for his niece would be better so we offered to get one to give to her and we will bring it next week. The focus then was to P as I asked if he believes. P says he has been blessed to grow up with a family who are Christian and it is all he has known. As I started to ask him questions about Eternity and what happens when we die, Rick arrived. We were able to check where P is with God. He thought he was going to heaven because he always helped people. So P wasn’t understanding the Gospel. After going through the law with the flip chart he agreed that he was deserving of hell punishment and what Jesus had done on the cross is what saves us. Any good works we do is not going to save us, we explained to him. Pray God will use the visual from the flip chart of the hell punishment Jesus bore upon himself, and His perfect blood shed for those who turn to Him for forgiveness of sins to receive His righteousness by faith, trusting in Him alone in what He has done for us on the cross. He showed us his power and victory by rising from the grave. Jesus is alive! it is finished! the work is done. Pray God will give P His grace and a deep Love for Him, and bring him gratitude and thankfulness to receive Jesus. Pray P will open his bible and read God’s Word and get to know and live his life for God’s glory and purposes. He was given tracts also to remind him of the Gospel. So pray he reads his Bible with God’s Spirit to guide him and also for his niece in the difficult time she is going through. Pray he will come back to pick up the Bible we will have for S.
The past 2 weeks we’ve had lots of encouragement in believers checking out the ministry and sharing with us their love for Jesus. Getting to know them better has been great. There has been some from out of town too, and they are encouraged to see the good news going out here at Warwick. It’s also good to build up and challenge our brothers and sisters in Christ to share Jesus every opportunity we are given. We who are His children are privileged to be a part of His work. Gospel tracts are a good resource to be able to plant the Gospel in many places and situations and they are going places where we don’t go. Let’s spread the great and wonderful news of salvation and use everything God has given us to reach out to the people. We give thanks to God and give Him all the Glory for His Sovereign work. Everyday is a good day to share the gospel and this Friday on the streets of Warwick was no exception. S approached the bible table and asked how much for a bible, pointing to the signs pinned to each side of the table we said they were free. He said his 8 year old son would love to have one, so we gave him a hard cover CEV. The CEV bible was donated by a young man some weeks ago who was impressed to see us out on the streets talking about God and giving away free bibles and resources, that he turned up with some extra bibles laying around home so that we could give them away - Praise God. This was explained to S who was really grateful to take this donated bible for his boy. S was asked if he himself is a believer - he said that his Grand Parents were. Glenda said that they would have been praying for him. He agreed they surely would have. We took him through the law and gospel in which he was saying that he understands while nodding as he was answering, sometime was spent spent with him talking about eternal matters and what that meant personally for him and that there was nothing more important than getting right with God. He took a booklet about the ministry, we also gave him a resource on some basic facts about the bible and how to read it, that was given to us from our pastor’s wife, they have been quite useful to accompany the bibles we give out. Please pray that God would draw S unto salvation and that the enemy wouldn't steal the planted word from him. Pray for his son as he now has a bible that our Lord will do the work in his life to bring him to faith in Jesus by His amazing grace. A mum and her two kids stopped by to encourage us saying that this was a great thing that we were doing, she is a believer from Tamworth up here on holidays, so after having a chat we gave here some ministry info, tracts for her and her children. We encouraged her to look us up online and share the Gospel where she lives. We spoke to M and then a bit later on J, two guy’s who believed in reincarnation, we asked where they got there information about there belief, M said it just sounded good to him. J said his mother told him when he was young about a truck driver who died the day he was born and when he grew up he became a truck driver. We told them that they were basing their belief on feelings not facts. Both were short chats but tried to plant a few bible truths with some gospel tracts, so we pray that the Holy Spirit will convict them of their false belief and bring them to a saving faith in Jesus.